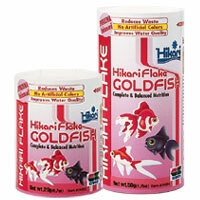 The goldfish flake all of your pet will love as much as you do. Two distinct flakes give your pet their best chance at a long and healthy life. The high caloric value and superior protein source promote proper muscle development, blood rejuvenation and improved growth! Rich in pure-cultured Spirulina and seaweed, this flake promotes remarkable coloration while improving metabolism and enhancing organ development and strength. Free of artificial colors and flavors thereby offering water quality improvement from the first day you feed it, Also eliminates the chances of staining of the silcone or contents. Highly digestible promoting effective waste reduction. Easy to use flip-top feeding spout reduces spills while maintaining freshness. Carefully feed the amount your fish will completely consume whithin a few minutes, based on your water temerature, pond condition and the activity level of your fish.